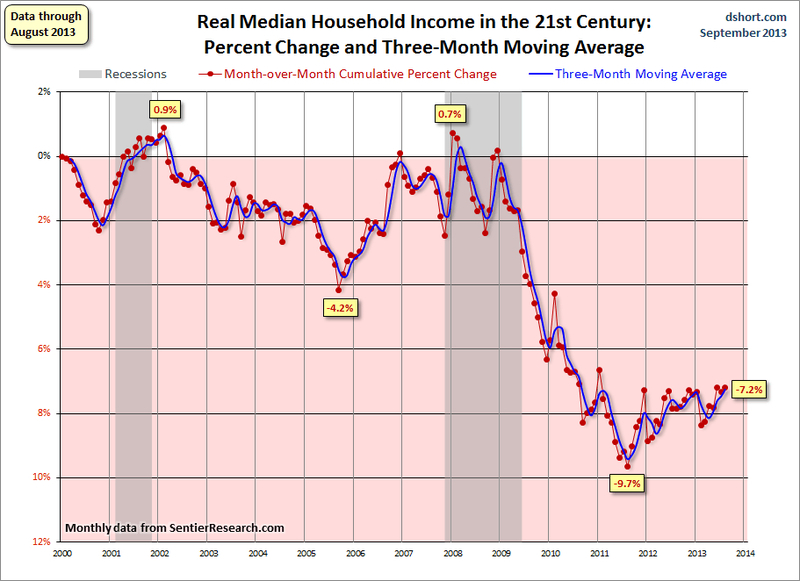 Incomes for those at the top continue to rise (based on increases in corporate profits, dividends, CEO salaries, property income, and capital gains) while, for everyone else, the trend (represented here in terms of real median household income) continues to be far below its pre-recession level. So, why all the talk of recovery, when in reality we’ve only seen a recovery for a tiny minority at the top? Hyping a recovery helps politicians to boost their popularity (or at least, slow its decline). It also serves to give masses of people with growing economic difficulties the impression that “other people” are experiencing a recovery. So they blame themselves (their age, skill set, education and so on) for missing out. The recovery hype thereby functions as a massive “blame-the-victim” program, in which a dysfunctional capitalism escapes criticism, while its victims instead turn criticism inward upon themselves. Hyping recovery pleases those seeking reassurance about the state of capitalism. They want to hear that it is – or will shortly be – the secure, near-perfect economic system they always thought and said it was. They want to see the system’s flaws, imperfections, and ongoing crisis – stressed by capitalism’s critics – as merely minor and passing irritations. Calming references to recovery – used often and said as authoritatively as possible – nicely suggest that capitalism is either healing itself or being healed by a benevolent government. Academic economists, with careers built celebrating capitalism’s efficiency, growth, and optimality for everyone, need urgently to hype recovery just as they have long hyped capitalism. They want to escape the ridicule of agitated students who keep taking on more crushing debt to pay for school, while their job and income prospects deteriorate. It’s time, however, to eliminate these weapons of mass distraction—and to face with sober senses our real conditions of life, and our relations with our kind.